Thanks to Hachette Audio and Libro.fm for my audiobook copy in exchange for an honest review. Out of the frying pan, into the balefire! Amalia Cornaro & Co. are back, and the stakes are higher than ever. After averting a civil war and treading a thin line of political deception, Amalia Cornaro has begun to accept her role as her mother’s heir – and all the responsibilities that come with it. Her role in the court of Raverra requires her to be many things, not the least daunting of which is the Falconer to her uniquely dangerous and sometimes unpredictable fire warlock, Zaira. Falcons and their Falconers are being murdered across The Serene Empire. Amalia suspects Lord Ruven, the powerful skinwitch and one of the seventeen Witch Lords of Vaskandar. With a new Witch Lord Kathe courting her, Amalia learns of the holding of the Conclave – a rare meeting of all seventeen Witch Lords to decide the course for war or peace. With the fate of the missing Falcons and Falconers weighing on her shoulders, Amalia and Zaira make a plan to infiltrate Vaskandar and learn the hidden secrets of the Witch Lords. Though I definitely enjoyed The Tethered Mage, The Defiant Heir is a much more well-rounded and interesting book than its predecessor. I feel like Amalia has really come into her own as a true power in Raverra and unto herself, making many challenging, difficult decisions throughout the book. And I loved loved loved Zaira’s character progression in her relationship with Amalia and her romantic interests. Saucy stuff. The Defiant Heir is an enjoyable read that pays off a lot from The Tethered Mage, then changes the game. 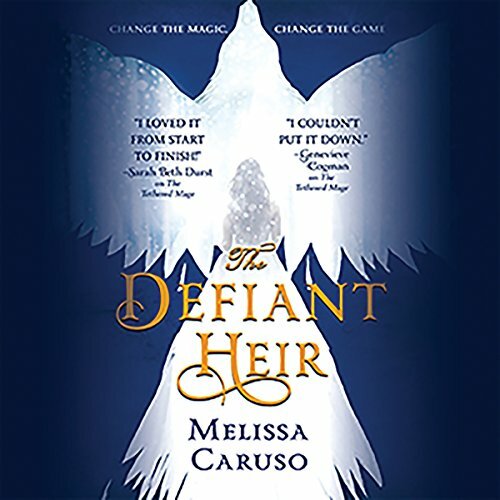 Hats off to Melissa Caruso for somehow reading my mind and putting exactly what I wanted in The Defiant Heir. Phenomenal sequel!